Justin and his friend Optimus Hung Schwieters…..
One more trip left in August……. Wow…..tough day. 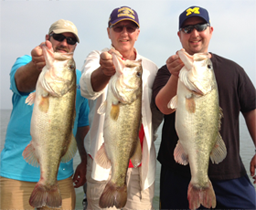 Total Fish: 10Best five about 19 lbsKicker: 8 lbs (me unfortunately) I have these guys again tomorrow. Its been on again off again here of late……let’s hope for on tomorrow. Didn’t get the job done today.